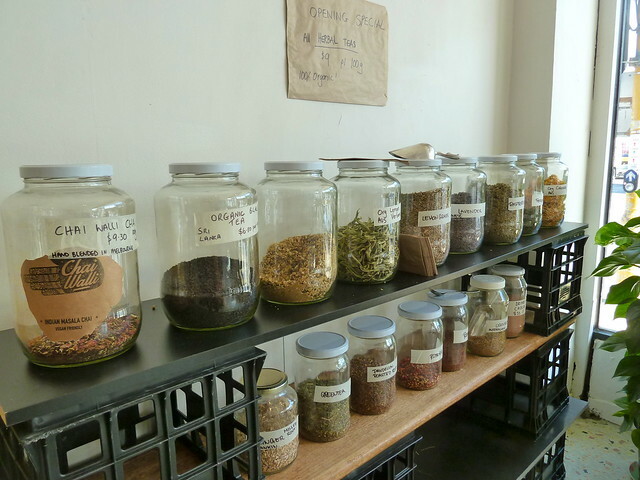 Thanks to your blog, I had the best day on Friday in the market and surrounds! I drew myself a map and marked in all your suggestions, going first to the grocery market (your suggestion) across the road from the station...where I found the Red Boat fish sauce! Sorry, can’t think of names and I’ve thrown out my bit of paper. 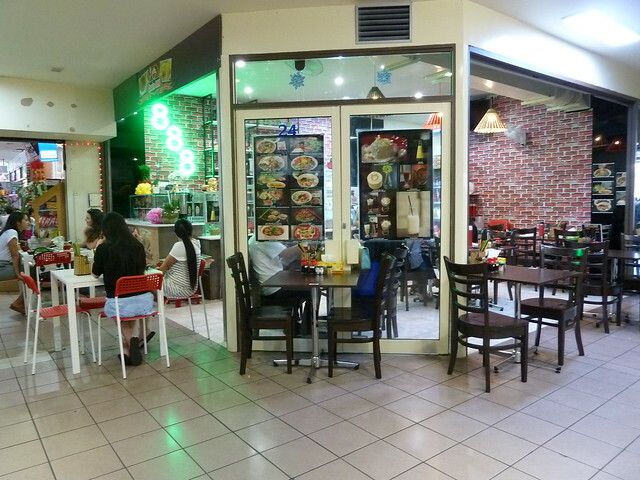 As it was around midday when I arrived on the train from Geelong, I headed for the place you recommended for Pho (Huong Vien?) Wow. I had the beef & chicken one. I’ll be back! Then went looking for Mama Rosina’s, but couldn’t find it anywhere. Never mind, found a little place selling grains and went in and asked them about Teff. They told me I’d get it at Bharat Traders, 580 Barkly St. As I was in Barkly St, I thought it can’t be too far.........!!! Anyway, got my Teff...and found out I could get a bus back...thankfully! This was another lovely memorable part of my visit. On the bus, I felt like I was a tourist in another country (not sure which one though...Vietnam, Nth Africa, India? :-) ) So many ladies offered me a seat beside them (taking pity on an elderly foreigner!) I sat with a Vietnamese lady and struck up a conversation with her, then an Indian lady in the seat behind joined in, both offering to help with directions. They were just lovely... One of them even got off the bus with me and walked me in the direction of Mesnoy Bakery. So...I got my Injera!! The two girls at Mesnoy were so friendly and helpful too. When I showed them my Teff they rolled their eyes a bit and told me exactly what you said :-( * Never mind...think I’d already decided I wasn’t going to attempt it. My son-in-law is going to though; he loves fermented stuff, so it won’t be wasted. Anyway, I’ll try and shorten my story. I had a great time stocking up...well, as much as I could. My fingers were nearly cut in half from the weight of my two shopping bags...and I had to get back to Southern Cross to catch the 6.30 train back to Swan Hill...finally home about midnight. Put all but two pieces of Injera straight into dehydrator overnight. 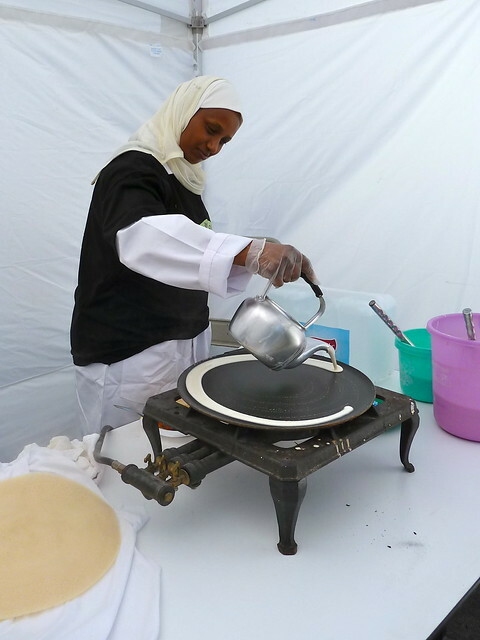 Next morning, beautiful crisp Injera chips, which I’ve put in cello bags & sealed. 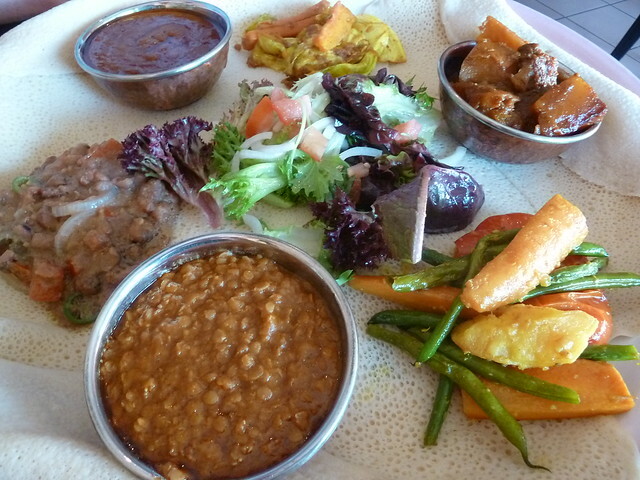 Misir wat (red lentils) at front left - I can't remember where I ate this but I wish I could! For lunch on Saturday we had Injera (freshened in microwave), with the red lentil recipe that I found on Mesnoy’s website. Yum! But it was even better cold as a dip that night with Injera chips!! Then on toast for breakfast yesterday morning!! The recipe made heaps. Half of it is in tubs in the freezer ready to have dip & chips again!! Can’t wait to go back...and take my husband. Very doable from Swan Hill. SH train passes through and stops at Footscray at about 10.30 am, then can pick it up again at about 6.45 pm without even having to go into the city! What a day we’d have...BUT first stop next time will be to buy a shopping jeep...or two!! As you can probably tell...I’m still on a high! 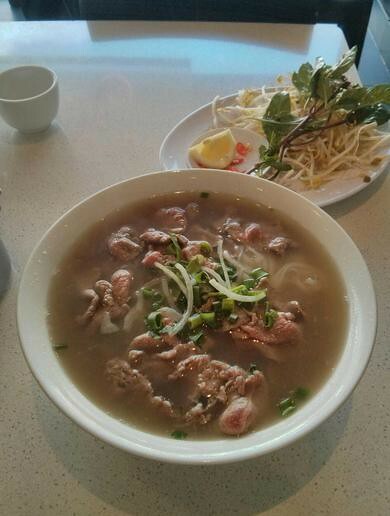 So...a big thank you again for introducing me to the culturally diverse culinary delights of Footscray! Thank you so much to Ros from Swan Hill for allowing me to share her delightful email. She has really touched on everything that makes Footscray amazing. * What I said re the teff was: In terms of teff flour - it's not legal for export, so you cannot buy it. The only exception is Bob's Red Mill which is an American company that produces teff flour (among others - coconut, amaranth etc). 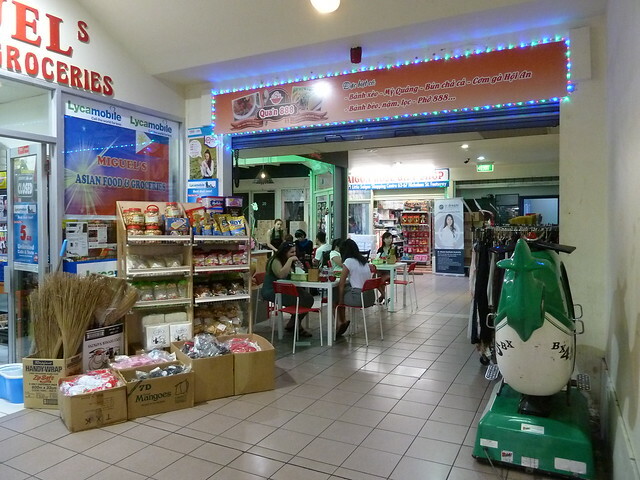 It's available at health food shops and at Sims supermarket in West Footscray. The catch is that that teff is apparently a poor grade so it's not very nice. 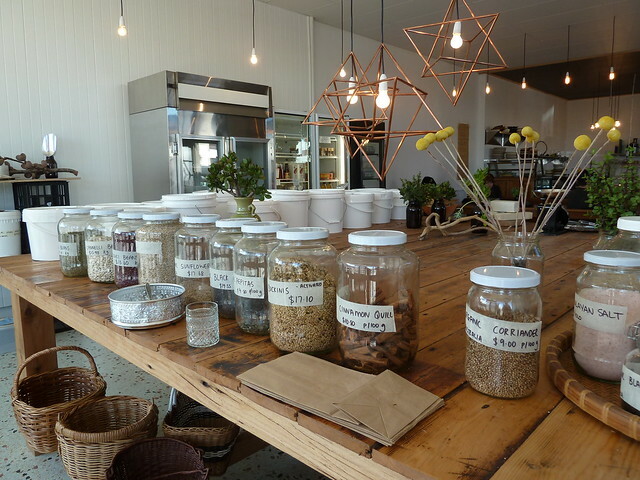 The Ethiopian community here in Melbourne don't use teff - they use combinations of corn, wheat, rice and sorghum flours to approximate the taste. "Ovest... Now, why does that seem so familiar?" I couldn't pick it. Then it dawned on me - it's the name of Footscray Hospital's cafeteria! As a friend said on Facebook yesterday, let's hope the name is the only thing the Ovests have in common! But anyway, let's rewind. 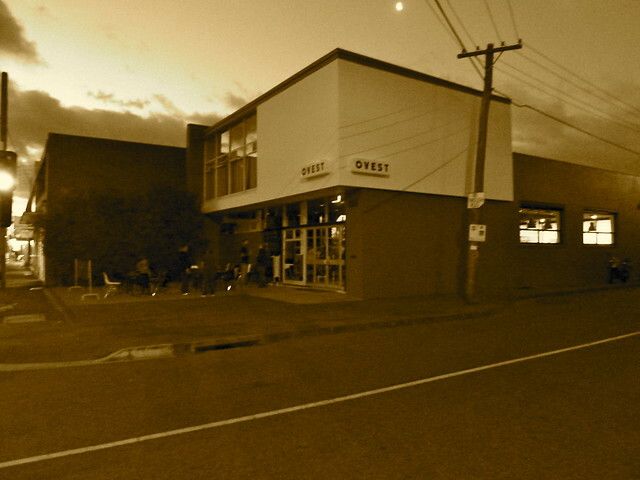 This post is not about "hospital Ovest"; it's about "new upmarket pizzeria Ovest", which just opened last night in Barkly Street, West Footscray. This is a partnership between Alex and Kate Rogers of Seddon's Sourdough Kitchen and Ben Sisley, ex-Mr Wolf, the Karen Martini-owned pizzeria in St Kilda. It is patently obvious they know what they are doing. Ovest has arrived fully formed, like some sort of incarnated being - at least from what we saw last night, there is no messy infancy here. 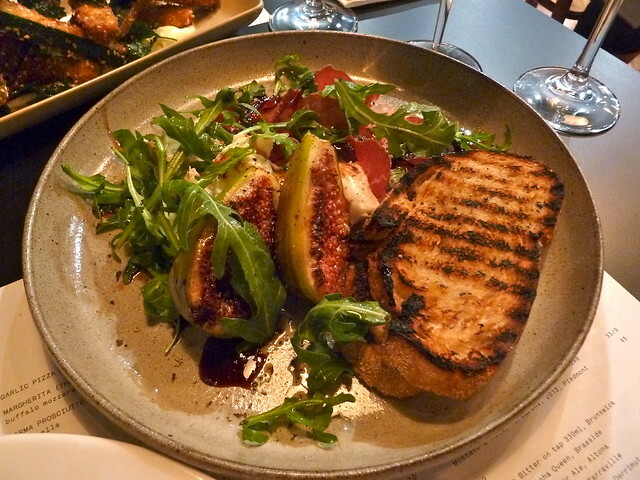 Loved this bresaola (air-dried beef) with huge fresh figs, vincotto, fresh mozz and rocket. The bread is of course from Alex's other business, Sourdough Kitchen. 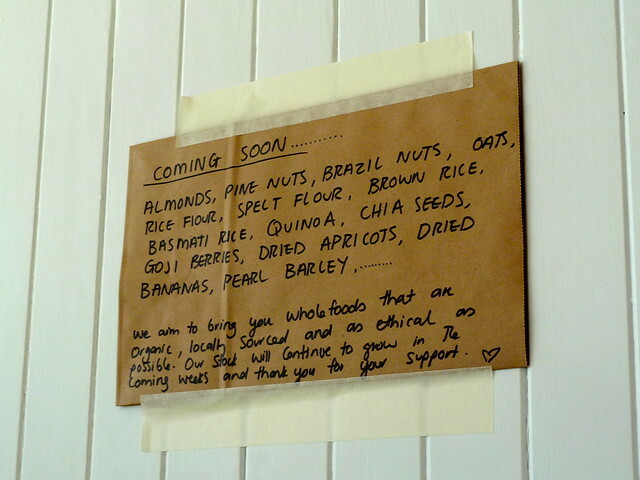 All the flour there and all the flour here is certified organic. 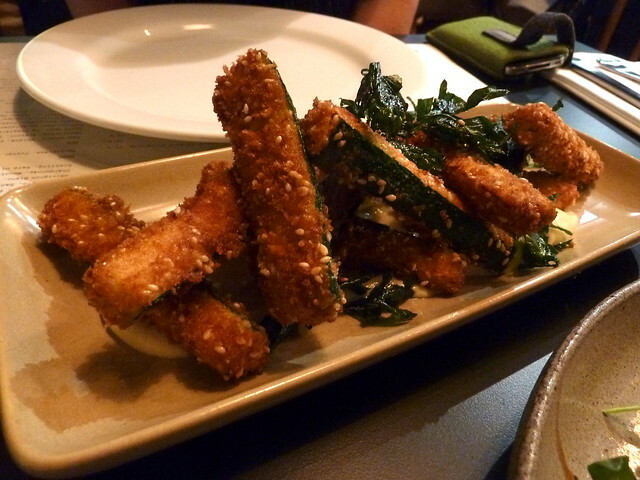 Zucchini fritters were gorgeous, with a non-oily breadcrumb-y crust just clinging to surprisingly juicy zucchini fingers. A good swizzle through some "truffle mayo" and they were even better. Look at that gorgeous thing, just rippling with prawns and tommies! I've always been a bit unexcited by fancy pizza joints as they seem dear for what you get. Twenty-odd dollars for dough and a smattering of toppings - but when the pizza is this good, it feels worth it. 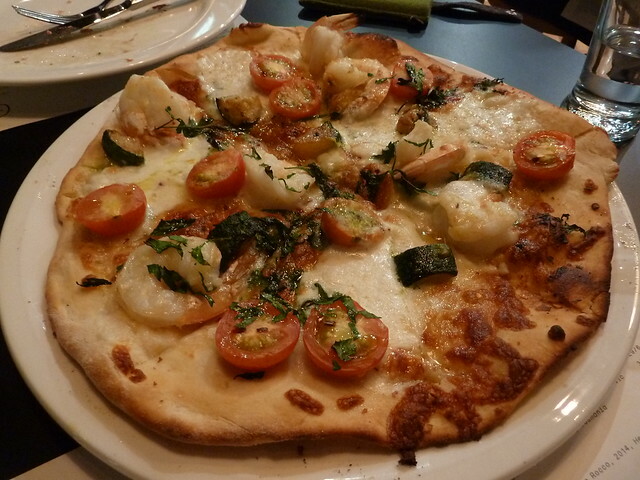 Plus, Ovest's pizzas are big - if you have starters, you probably only need one between two. 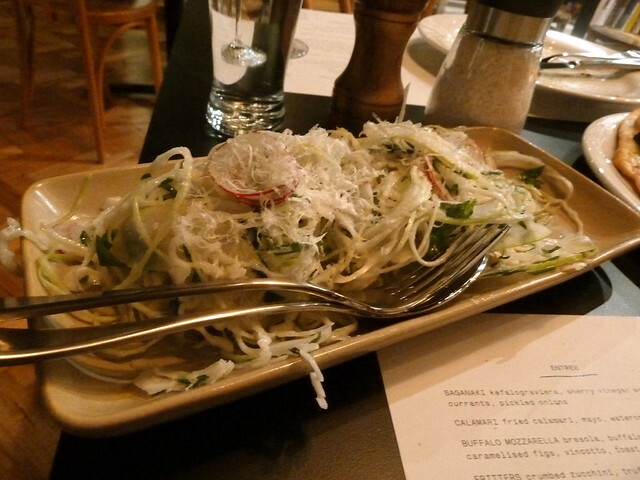 If you want to be extra greedy, get a side like this lovely coleslaw with cabbage, pear, radish and lemon. If you want to bypass the pizza, there's a tuna nicoise that looks the business, as well as pork and veal lasagne, cannelloni, and a daily roast special. The kids menu is good value and a smart addition to a family-heavy area - your choice of lasagne, two pizzas or cannelloni plus ice-cream scoop for $12. There is gluten-free pizza for $1 extra. 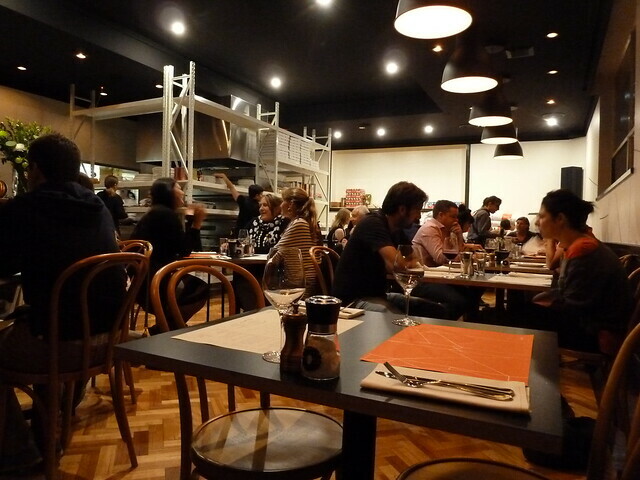 Ovest were almost full on opening night last night, which had not been publicised widely, so I would imagine they are only going to get even busier. Queues in WeFo - who would have thought? And as for "hospital Ovest"? For all I know, they do a brilliant Friday lasagne special. If you have a hot tip there - let me know! What level Vietnamese diner are you? Level 2: *cracks open Fanta* "I'll have the beef in black bean and the prawn crackers. Hey, darl, next week let's try the Vietnamese food at Laksa King, eh?" Level 4: *blows delicately on cup of free tea* "The Vietnamese pancake, please." Level 5: *swizzles cà phê sữa đá with long teaspoon* "The banh xeo, please." Level 6: *sips corn milk and smiles* "Tôi muốn bánh xèo." Don't think I'm level 6. I got that phrase off Wikipedia. (Hopefully it doesn't actually mean "crazy hog mattress" or something equally bizarre, or rude, or embarrassing.) Anyway, if you are a level 3 through 6 - ie, if you're willing to try something really different - I have an absolute treat for you. 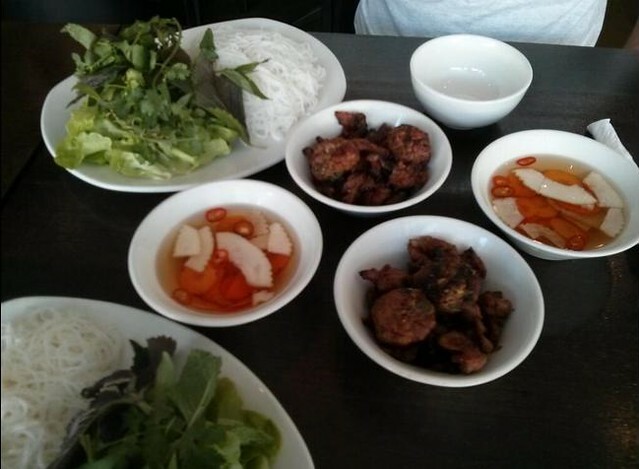 So you know how there is northern and southern Vietnamese food? (Level 5s and 6s, of course you did.) The south is mad for sweetness, seafood, and mountains of herbs, whereas northern dishes are supposedly plainer (although to me, they taste equally - if not more - amazing). 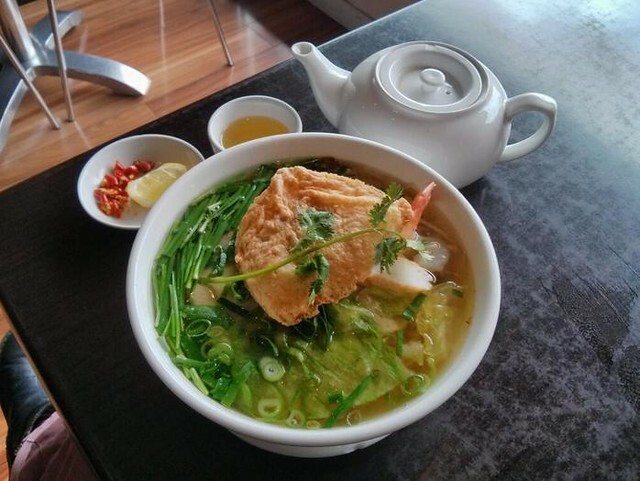 Typically southern dishes include hu tieu mi (rice/egg noodle soup with prawns and pork - see pic above) and banh xeo (giant, coconutty filled pancake) while the north specialises in bun cha Ha Noi (chargrilled pork pieces and patties with rice vermicelli), cha ca (fish seasoned with turmeric and dill and served with rice vermicelli), and bun ca (fish soup with dill, tomato and taro stem). But there's another entire Vietnamese regional cuisine that often gets completely overlooked - central Vietnamese cuisine. (Level 6s already knew that.) To quote Jamie Feldmar in this Serious Eats article, "Central Vietnam has its own spicy, strongly-flavoured cuisine, distinct from the Chinese-influenced fare of the North and the light tropical flavours in the steamy South". 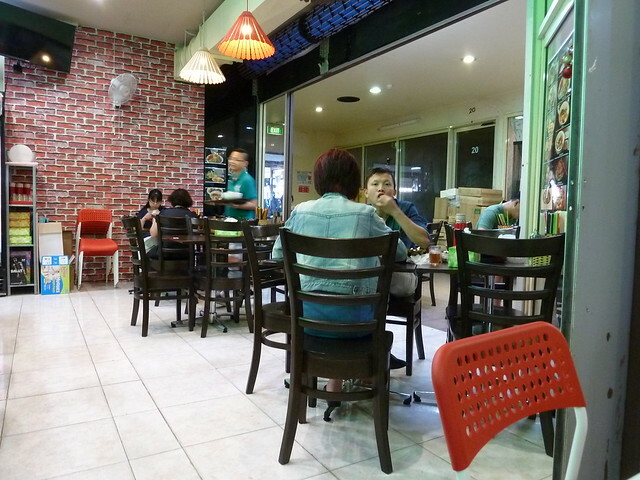 And Footscray now has a dedicated central Vietnamese restaurant for your dining pleasure. 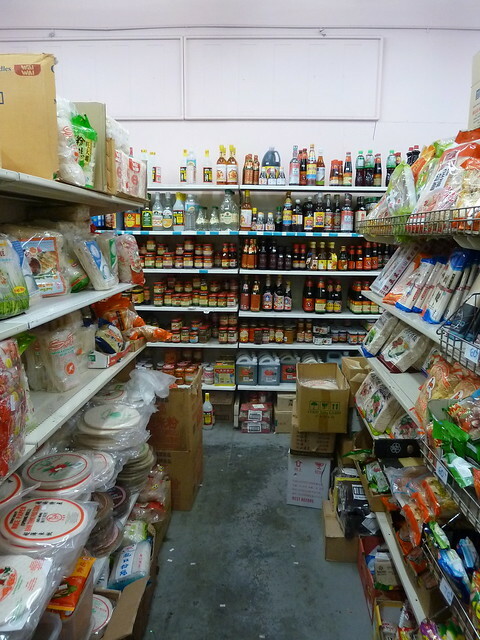 Meet Qua'n 888, quite literally tucked away in Little Saigon market. 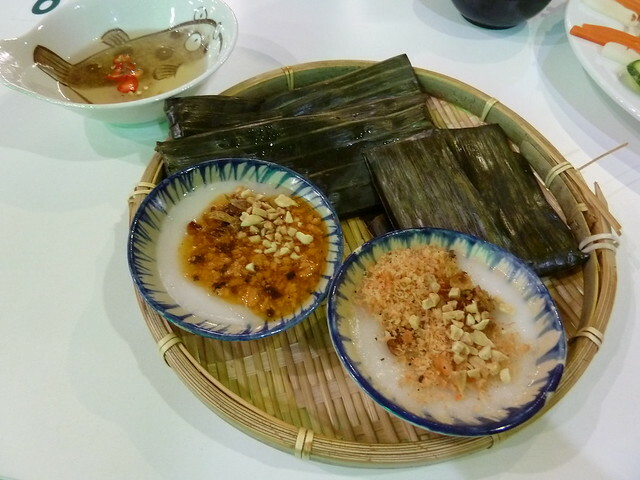 This newbie serves food from the central Vietnamese cities of Hoi An, Hue and Da Nang. 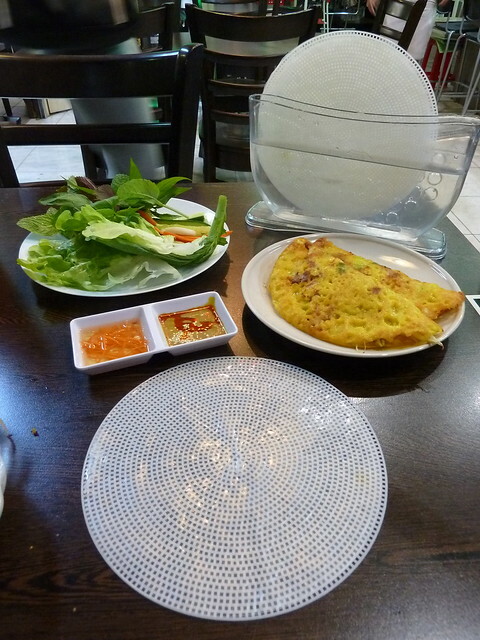 The banh xeo or Vietnamese pancake mentioned above is normally a giant crepe as long as your forearm, stuffed to bursting with mung beans, bean shoots, prawns and chunks of pork. 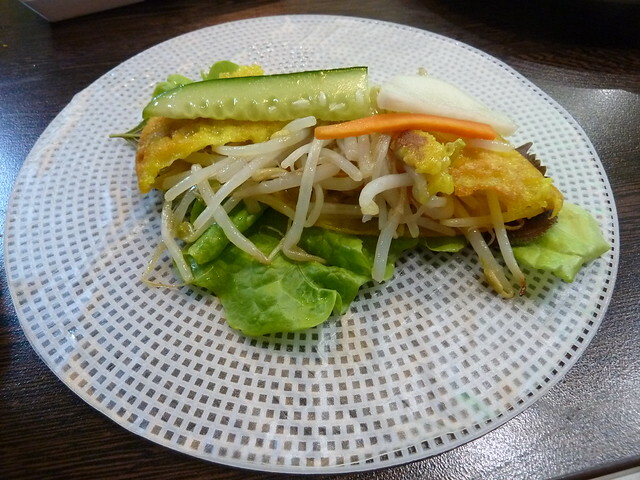 Apparently that is not "the" banh xeo, but southern-style banh xeo. 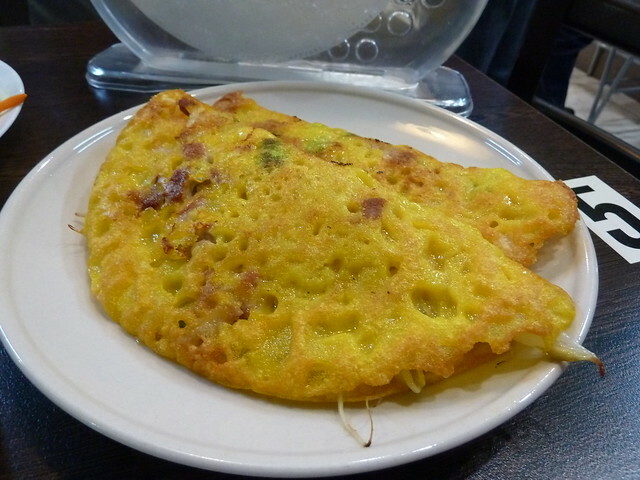 Here at Qua'n 888, the banh xeo is central style. That translates to these two fat, yellow little pancakes, not over-filled with prawns and bean shoots, plus herbs, two dipping sauces, and a really intriguing giant rice paper-wetting contraption. 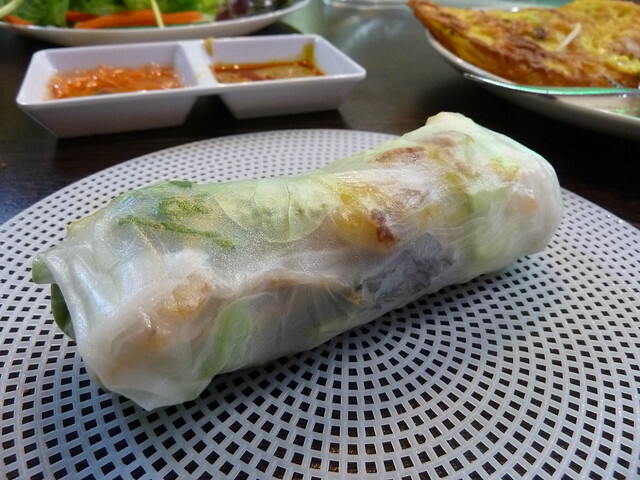 What you do is set out your gridded plastic mat and then gently and quickly roll your rice paper around the thin yet deep reservoir of cool water in the rice paper holder. Place the still quite hard sheet of rice paper on the mat. Wait a minute or two and then start loading with 1/2 a banh xeo, herbs, rice vermicelli etc etc. Level 4 and below should put less in to start with. Level 5s and 6s can go to town right off the bat. I won't explain here how to roll them up, but check out this YouTube video (I've started it at the "rolling" point). Suffice to say the finished product should look something like this. You can then go crazy dipping your roll in either the house-made special sauce (I tasted sesame?) or the classic nuoc cham seasoned fish sauce. Want more chilli? Get stuck into the pot of sambal oelek-style chilli sauce on the table - Qua'n 888 make it themselves. At first I was not so crazy about the banh xeo pancakes themselves - they didn't have that super coconut flavour and delicate texture that, say, Co Do's have - but once you've got them in the roll, I see how they really work with all the other textures and flavours. 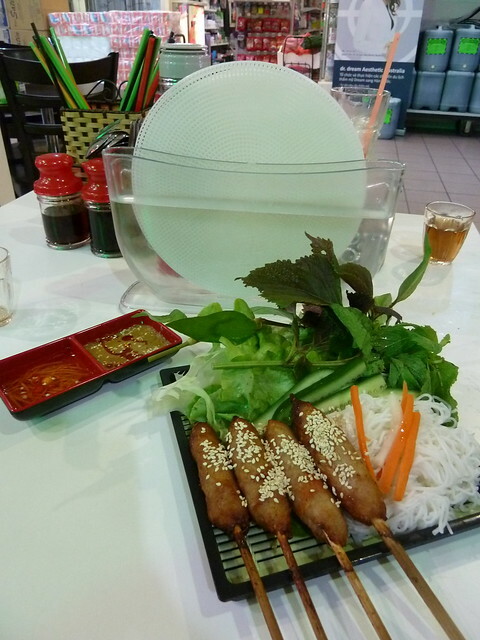 You've got the cool of the cucumber, the slippery rice vermicelli, the rich crunch and squidge of the pancake, plus a big dousing of the delicious dipping sauce (I preferred the nuoc cham with them) - you've just gotta try these. But what you really, REALLY have to try is the banh sampler. I have an ongoing obsession with these varieties of steamed cake. I order them whenever I see them (which is pretty much nowhere - Thanh Ha 2 in Richmond and Co Do in Sunshine spring to mind) - and I've always liked them. But now I realise I've liked them in the way you might like a croissant from Baker's Delight, until you taste one from Lune. THESE ARE OFF THE HOOK. 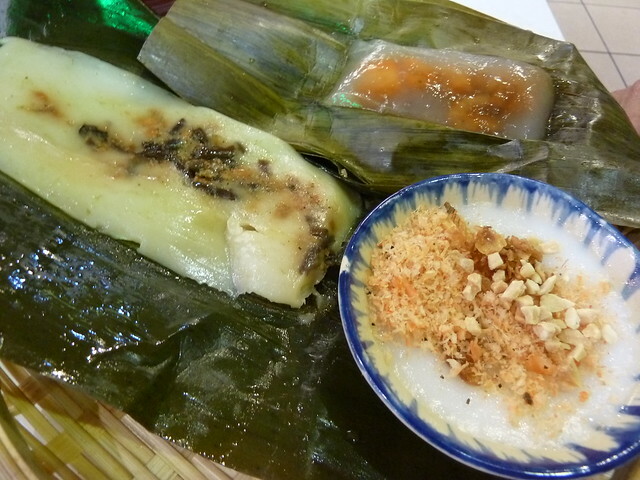 I've never seen the banh beo served traditionally like this in little dishes before and now I see why the best ones have to be contained - they are so delicate, like a rice custard almost. 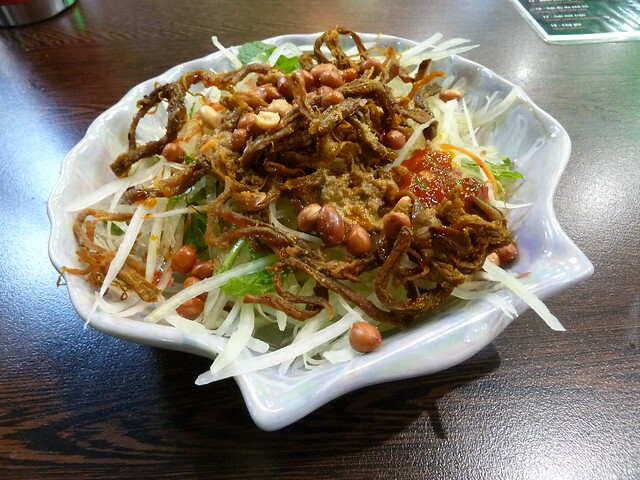 They're topped with minced shrimp, fried shallots and peanuts. Then there's the banh nam, a Vietnamese tamale of sorts - a delicate rice flour batter mixed with mushroom, prawns and pork. So delicious. Finally, banh loc, which I believe is tapioca flour with a bouncy, al dente texture (others I've had have tended towards gumminess - not here). Inside hid pieces of prawn and pork like fossils in amber. All were absolutely spectacular. I really liked this green papaya salad with beef jerky. Sure, it didn't immediately punch you in the nose like some versions do (that's a compliment - sometimes that big rush of sweetness, herbs and chilli is exhilarating) but crept up on you slowly. The dressing was quite muted, but I liked being able to really taste that rich, deliciously dry and almost feathery seasoned beef jerky, the little roasted peanuts, and all the delicately julienned papaya without just tasting "things" drowned in nuoc cham. 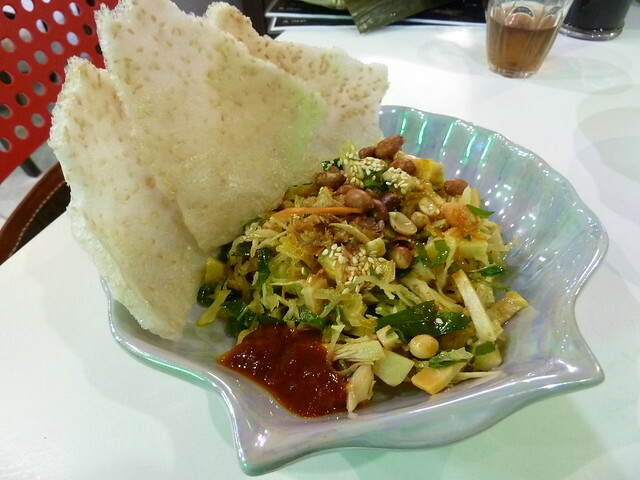 Likewise, I really enjoyed this steamed jackfruit salad, which I've never had anything like anywhere in Melbourne. Rather than being a maze of crunchiness like other Viet salads, the steamed jackfruit was tender, with bits of bouncy cooked prawn, bi (shredded pork skin) and julienned herbs. You pile it onto the crackers like a Vietnamese tostada. I shared this with my dad who thought it needed more kick, but I liked its humility. 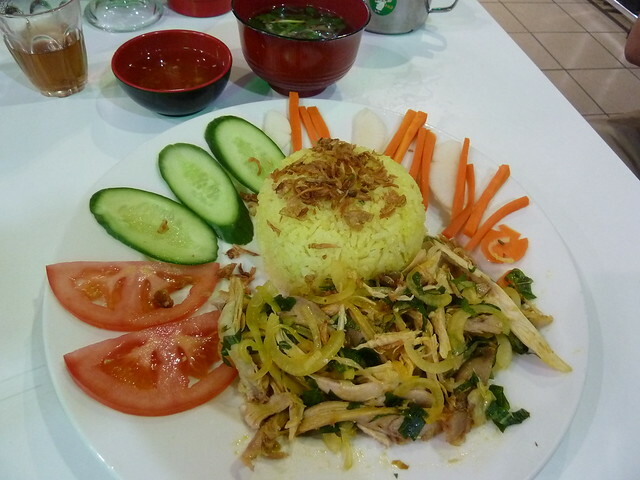 This is a special chicken dish from Hoi An - shredded chicken with a little cooked onion and herbs, with yellow rice, crunchy veg and a ginger dipping sauce. Level 1s and 2s, if you are dragged here by some intrepid foodie, this is the one for you to order. Level 3s, this might be a good place to start. The chicken and rice were fine; the ginger sauce was delicious...but I am more interested in the really unusual dishes on the menu. More wrappy-rolly action with nem skewers. Do these in exactly the same way as the banh xeo. I didn't find the pork skewers particularly flavoursome but as with the banh xeo, once they are all tucked up with herbs, vermicelli and so on, the ensuing roll is really delicious. 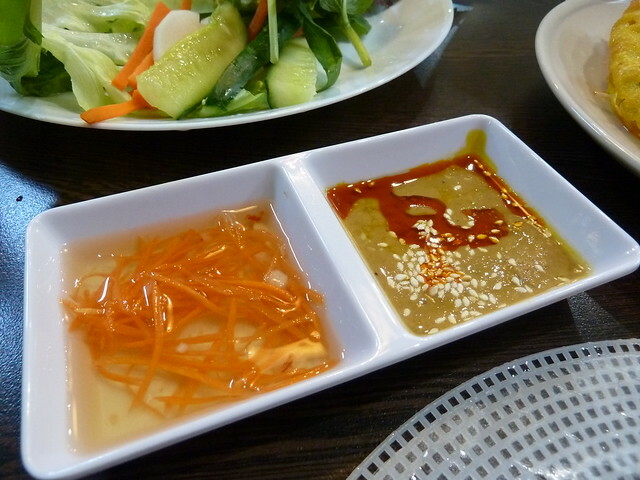 I reckon this one goes perfectly with the sesame sauce rather than the nuoc cham. 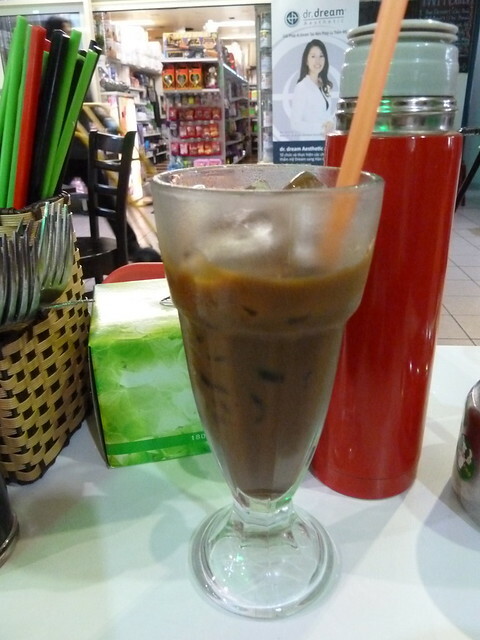 The lovely owners taught my dad how to ask for "strong coffee" - ca phe sua da "dam" (said like "dumb", with a low tone) - and this was the delicious result. And if you want to get some level 6 cred, try their sua bap or "corn milk", served in adorable peaked bottles. I haven't gone there yet, but I will! 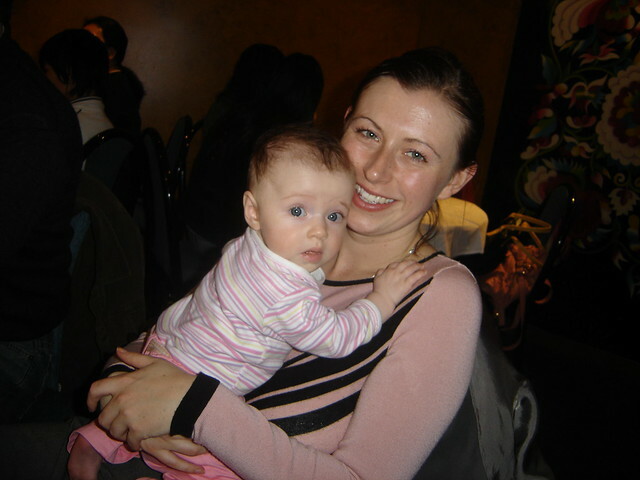 Here are the super lovely owners of Qua'n 888, sisters Katie and Donna (L-R, with Donna's gorgeous bubby in between). 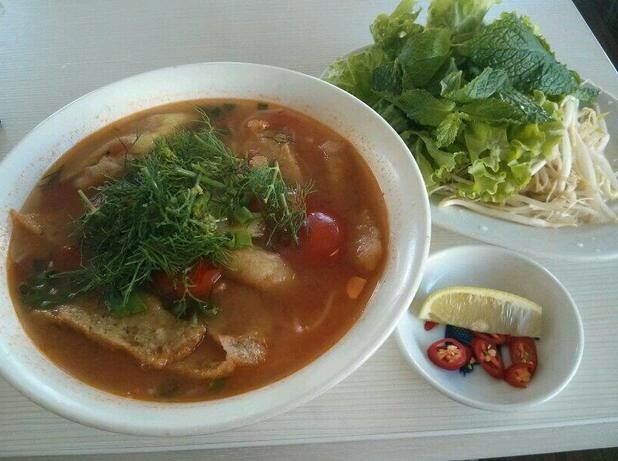 They are originally from Da Nang and are very excited to share their regional specialties with you. They are so friendly and I am sure will be happy to give you any eating tips. Their dad comes in from time to time to help them out, so it's a real family business. 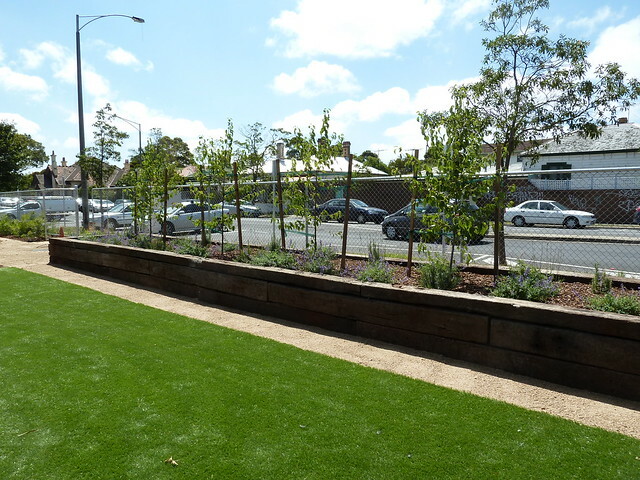 And you know, no matter how many bars, snazzy cafes or other tropes of gentrification manifest on the streets of the 'scray, it's THIS trend in Footscray's development that makes me the most excited. Younger first- or second-gen Vietnamese-Aussies like Thu at Co Thu Quan, Ashton at HM Quan and Donna and Katie here at Qua'n 888 starting small, uncompromisingly authentic food businesses that make no attempt to dumb down their food at all - and nor should they when it tastes this good. 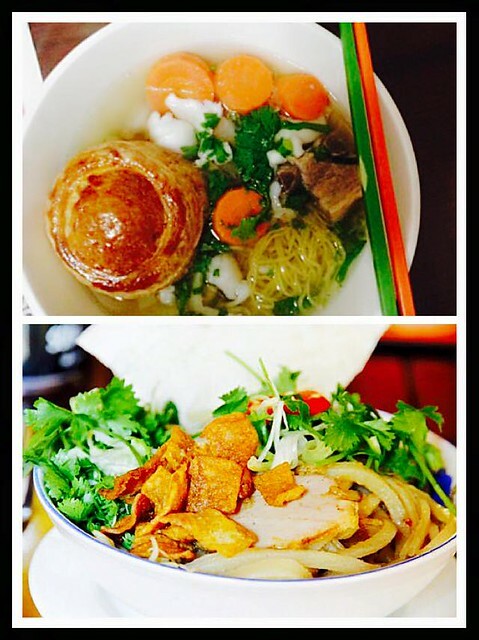 Two new regional Hoi An dishes have just landed at Qua'n 888 - cao lau, which is a dish of BBQ pork, croutons, greens and maybe some bean shoots on top of special noodles that can apparently only be made with a special type of well water from Hoi An. (Read more here.) Katie had told me about the cao lau (the second picture above), but I'm mystified by the other new dish (the first picture above) called "mi ca atixo", which I think translates to fish with egg noodles and artichoke?! So if you fancy levelling up in the Vietnamese diner stakes, head through the Ryan Street entrance of little Saigon and hang a right. Sip that corn milk, that coffee or that tea (or all three!) and order up something you've never had before. And I reckon even if you're a Level 6, you will find something on Qua'n 888's menu that is completely new - and delicious - to you. * involving or limited to basic principles. * relating to an immature, undeveloped, or basic form. Well, if this is what creator Des thinks "basic" or "immature" is, I think we probably all have a lot of catching up to do in the ambition stakes! 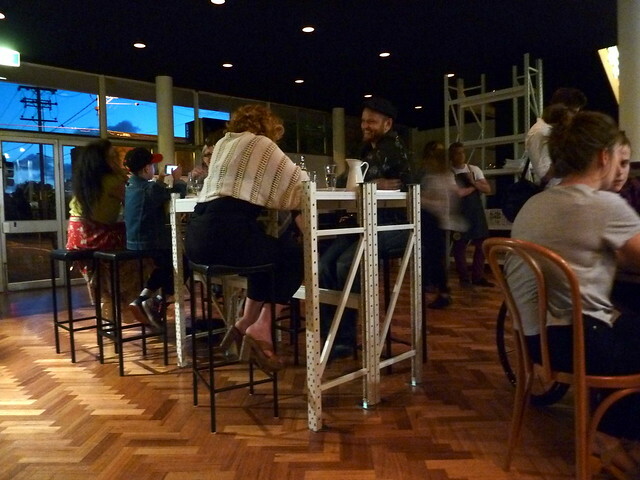 Footscray - meet the very modestly titled Rudimentary. 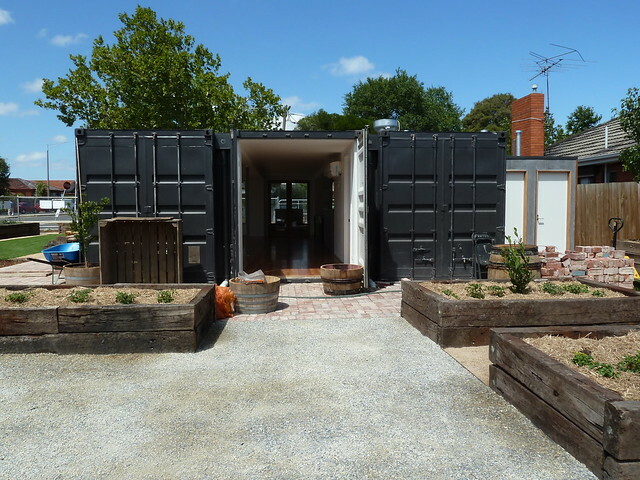 This is a new cafe, set in a gorgeous, rather huge native and kitchen garden, at the corner of Leeds and Donald Streets in downtown Footscray. It's not open yet but it is not far off. 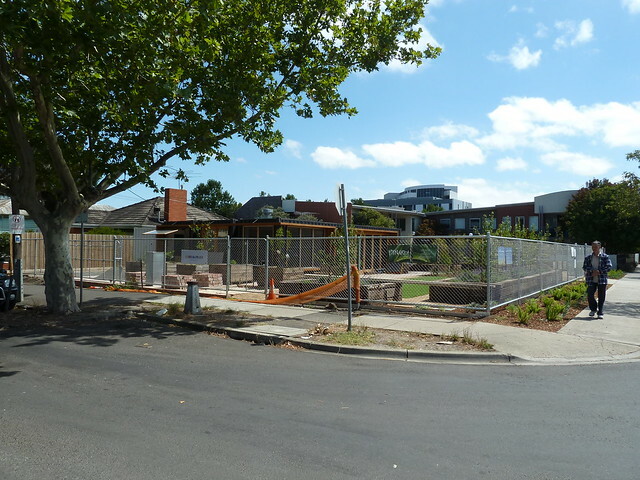 The story behind Rudimentary goes like this: The block is owned by Des' father and has been a derelict car park for about 15 years. Rather than develop or sell it, Des' father asked his son if he'd "like to do something with it" - and this is the result. Des studied architecture and is passionate about reusing old materials. 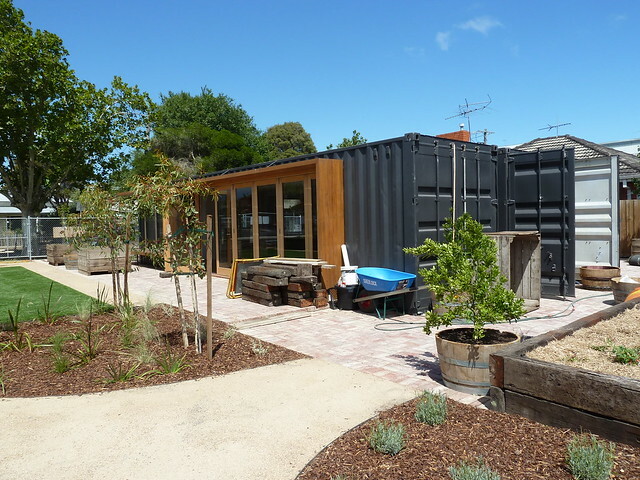 The actual structure of the cafe is made of four decommissioned shipping containers welded together. It would be tricky, he says, but it could technically be picked up and moved elsewhere, rather than having to be demolished. "The actual structure could be anything," says Des. "One day, maybe my house!" This malleability is where the "rudimentary" tag originates. Des wanted to keep it basic, to keep it simple. This also translates into a commitment to environmentally aware design and features. 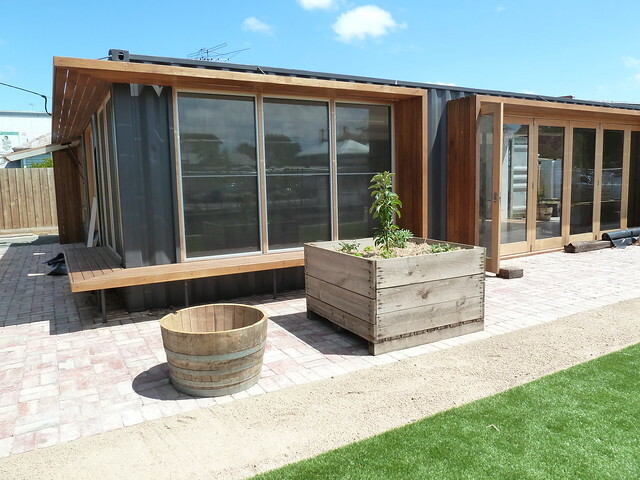 A box gutter on top of the containers collects water and siphons it into a huge on-site tank, and Des has calculated there will be only 50 days per year they will need to rely on mains water. 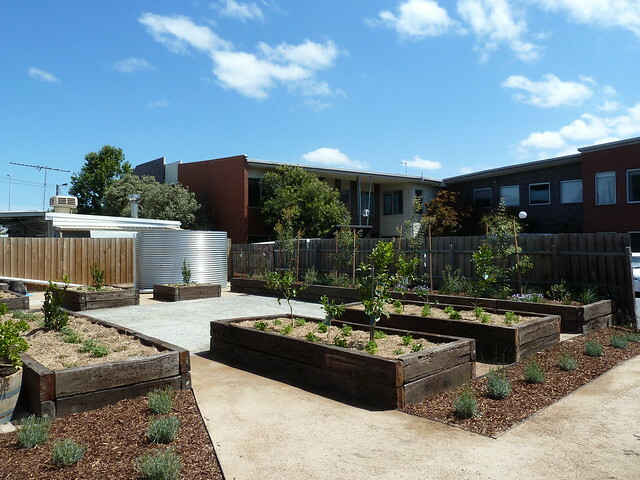 There is passive cooling and heating design incorporated into the building, plus worm farms and composting systems on site. Des preferred I didn't take a pic of the interior as it's still a bit of a bomb site, but I can tell you you would have no idea you are in a series of shipping containers. It's bright, light and airy with polished floors and an open kitchen, and there's going to be a big communal table. 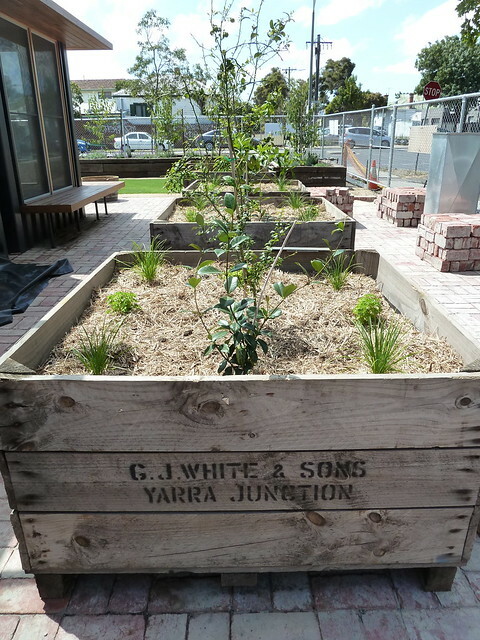 The garden has been designed by local landscaper Sally Browne and incorporates hardy natives and kitchen garden staples like chillis, chives, bay leaves and Vietnamese mint. There are apple, pear and lemon trees too. Just here near the walk-up takeaway window will be a big row of bike racks. Des has recruited a chef but is tight-lipped about who he is (it is a male). What he could tell me was Rudimentary will serve breakfast and lunch, focusing on "good quality fresh produce and seasonal food". 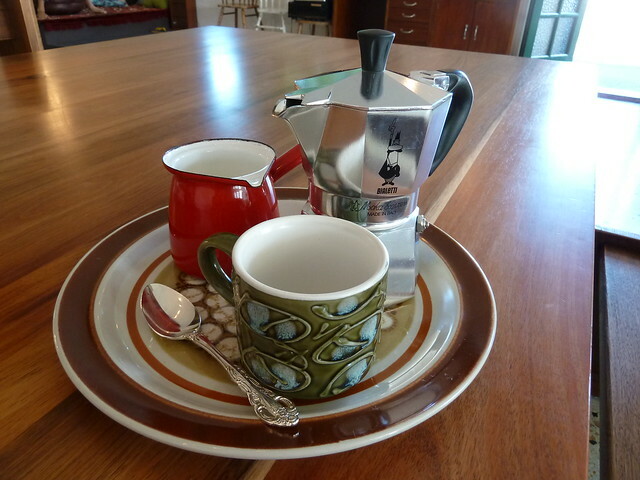 The coffee is going to be by Small Batch and will be delivered to your adrenal glands via a La Marzocco PB. And who is this mysterious Des? He wouldn't let me take a picture, but he is a capable and confident young man who is working on this project with his two partners, Lieu (also his partner in the other sense) and Michael. 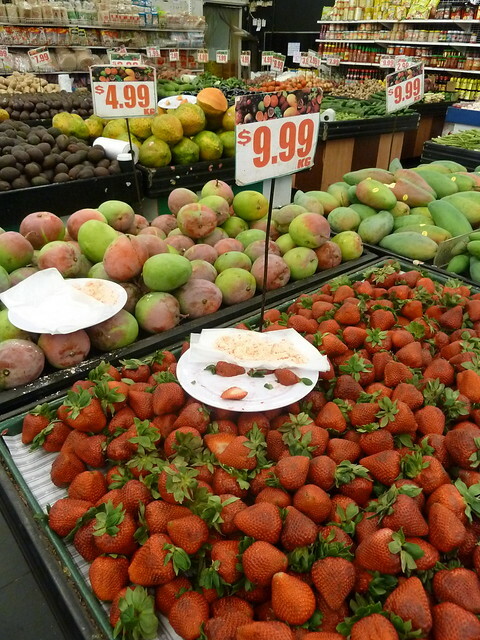 His family own a seafood wholesale business and at one time owned the fish shop inside the old Bi-Lo at Little Saigon. He tells me that while he has never lived here, he essentially grew up in Footscray due to his parents' local business. Given the interesting comments made on my Fox in the Corn post debating the changes in the area, I asked Des what he thought. 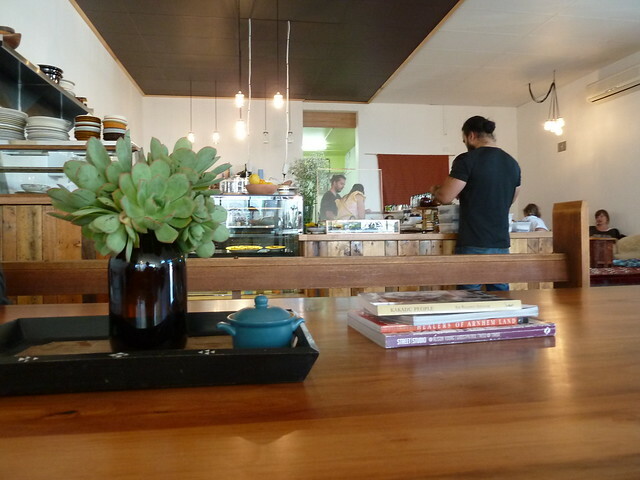 "Footscray is interesting because it just goes on doing what it does without giving a crap," he said. Nailed it. 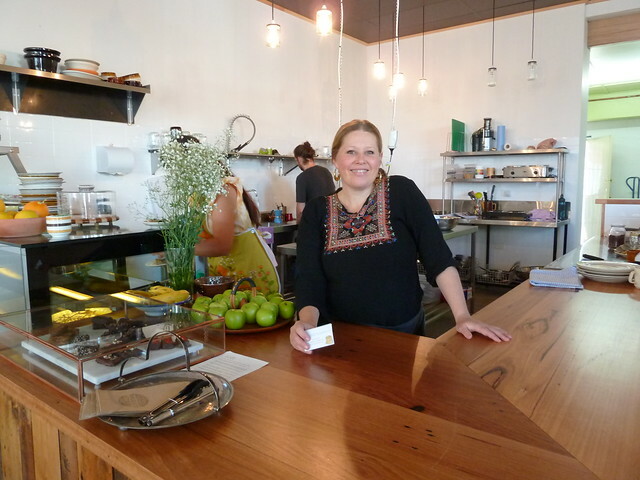 Rudimentary is scheduled to open on February 23. Stay up to date with all the developments on their Facebook page. So an era ended for me on Friday. After over 9 years of being pregnant and/or raising little kids, all three of my daughters are safely delivered to primary school. Everyone keeps asking me, "What are you going to do with yourself?" The question is more what aren't I?! I am so excited for this new beginning and for weeks I had been planning the perfect place to have a celebratory meal. I wanted somewhere delicious. I wanted somewhere serene. And I also wanted something symbolic, something that would signify a fresh start - not just another plate of smashed avocado. 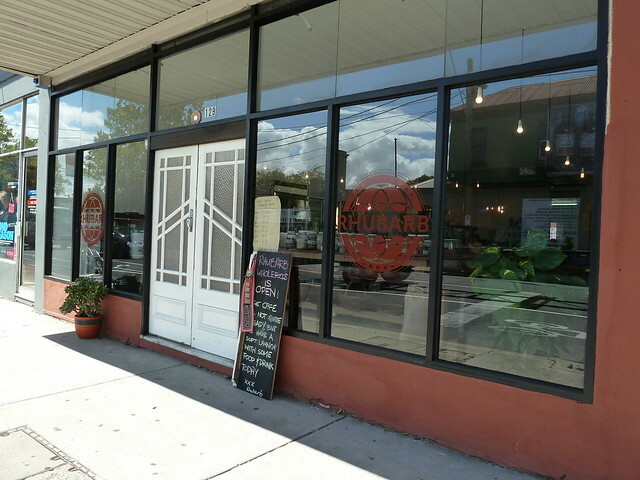 Enter Rhubarb Wholefoods. This has opened on the old site of the May Hong pool hall on the corner of Buckley and Victoria Streets. When she was a baby, every Friday I used to put my oldest child in the occasional childcare on Buckley St kind of opposite (it has since closed). I would drop her off and walk past May Hong, feeling free as a bird, down Victoria Street to brunch at Le Chien. It's not an exaggeration to say that I lived for those few hours on a Friday morning. 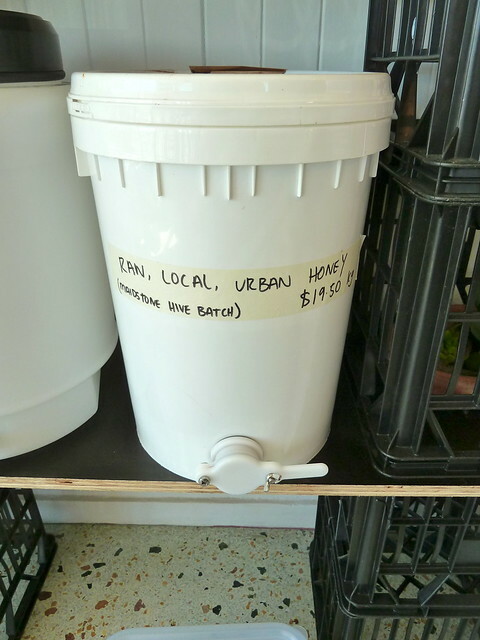 ...and local raw Maidstone honey - totally trying this. Not pictured is the fridge full of cashew cream, chocolates, and various pickled things. The full menu is not yet up and running but they have a small spread in the meantime. This was everything I wanted and more. 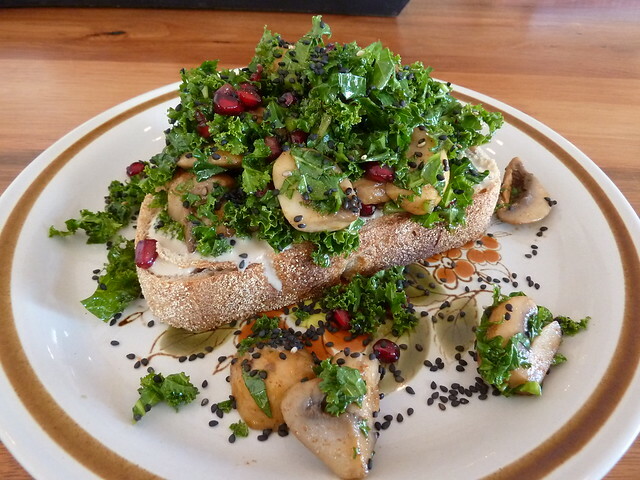 A big wedge of great sourdough, spread with tahini, and surfing on top gorgeous springy slices of mushroom in lemon and hot paprika, loads of perfectly cooked kale, and tangy, bursty pomegranate seeds. This wasn't your average soggy, undersalted "health food". You could tell that the cook knew their way around a pan. 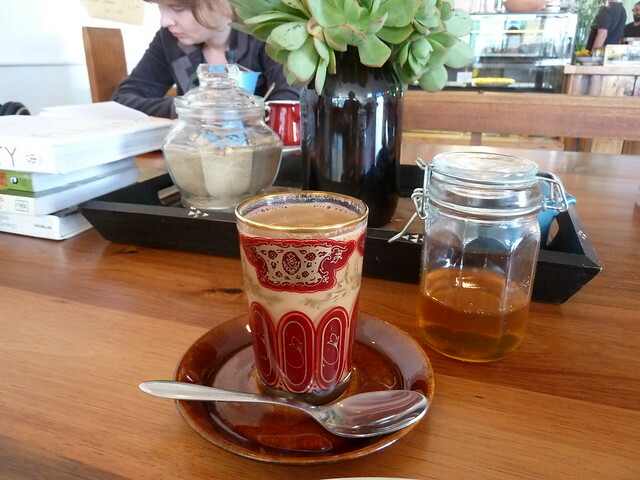 ...but there is chai which is more the authentic Indian style vs a chai latte. It was delicious. Meet Natasha, the owner. The plan is to have a spread of different salads at lunch that you can make up a plate with, and an Indian night once per week. I love this kind of food - I can just feel my liver vibrating joyously at the sight of it - but if you can't imagine brunch without poached eggs, bacon and a latte, this is probably going to be the wrong spot for you. This year is also a new beginning for me as I am taking my life in a new direction. 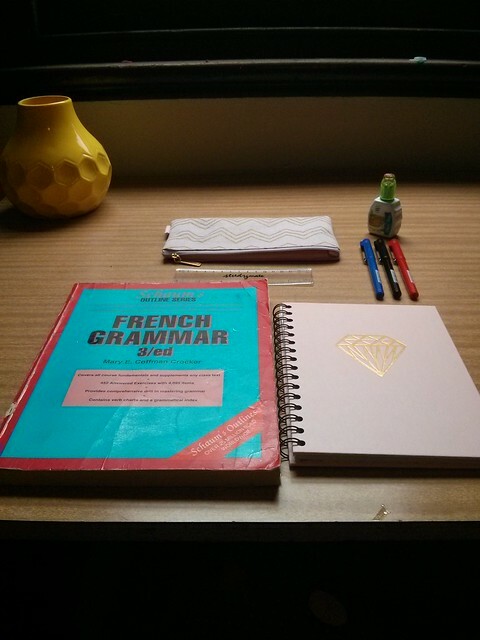 I have decided to return to university in 2016 to pursue graduate study in linguistics. Languages are a deep and abiding passion of mine. 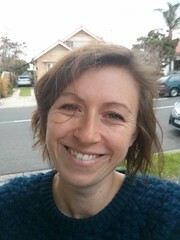 I was raised in a bilingual Australian Signed Language/English home, became fluent in French through eight years at school, and did an undergraduate degree majoring in Arabic. I'm spending 2015 getting all my languages back to the standard they were at before kids took over. So unfortunately, if you missed out on one of my food tours or food events before now, there won't be any more - at least for the foreseeable future. 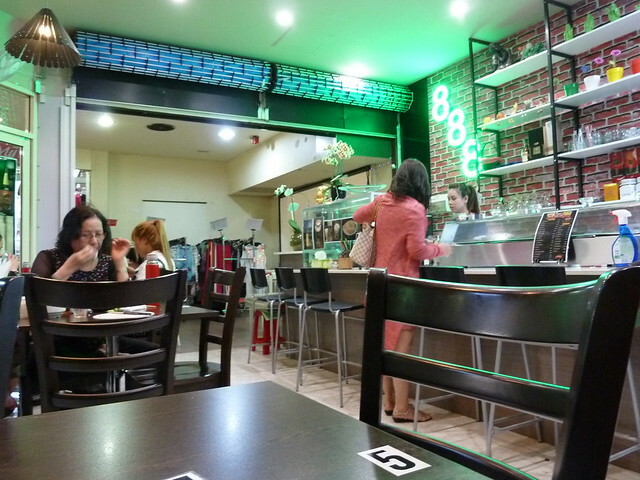 Likewise, I will not be contributing freelance to any more publications - the only place you will be able to read my words is right here on Footscray Food Blog. 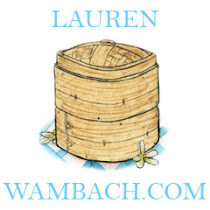 I love bashing away at this blog, even if my contributions are on the sporadic side sometimes. Rest assured I am not going anywhere! So what else did I do on my fresh-start Friday? 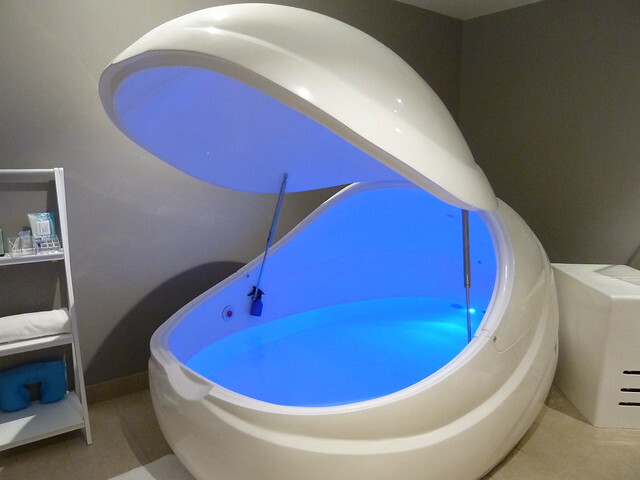 What else but have a flotation tank? No, I do not like to do anything by halves! And I look forward to bringing that same attitude to my new direction.